A Gloucester teenager who was so shy he’d pull his hoodie over his head so people wouldn’t speak to him proved how far he has come – by giving a moving speech at the national HSBC Young Enterprise Awards. Lee Grimes won the national special achievement award in recognition of his personal development from a shy and nervous person to an outgoing and confident young man and managing director of National Star’s Young Enterprise company. Not only did he collect his award, Lee spoke in front of almost 500 people at the gala dinner at BFI, London. I couldn’t believe it when they said I won,’ said Lee. ‘When I went onto the stage to collect my award they asked me about my goals for the future and I told them that I had a paid job. Entrepreneur and Made in Chelsea star Amber Atherton tweeted about Lee, praising his ‘tremendous humility’. 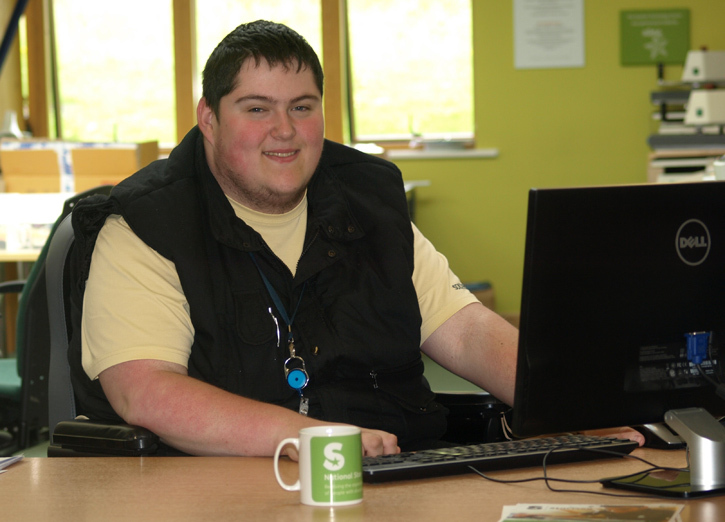 Lee, who is a Skills for Work student at National Star, last month won the South West regional achievement award. ‘When Lee first arrived at National Star he was the most shy, quiet and nervous person I had ever met, partly from his experience of being badly bullied in his previous mainstream school,’ said James Garrod, Enterprise Developer at National Star. Lee has cerebral palsy and uses a wheelchair. The 18-year-old said hiding in his hoodie was his way of coping with bullying. ‘At lunchtime I would sit with my blazer over my head so that people wouldn’t talk to me and the bullies leave me alone,’ he said. He reluctantly agreed to be managing director of National Star’s Young Enterprise company – called PIP for Personal Image Printing – after voted in by the team. Lee, who is a Skills for Work student at National Star, is currently working two days a week in a placement at Gloucestershire Royal Hospital. It is hoped that it will become paid work when he leaves National Star later this month. ‘All my life I thought that I had a disability and who in their right mind would hire me. I always used to put myself down. Now I think I can be independent and have my own life,’ he said.